Details: Poultry meat and skin. Gelatin Silver Print. 5" x 7". 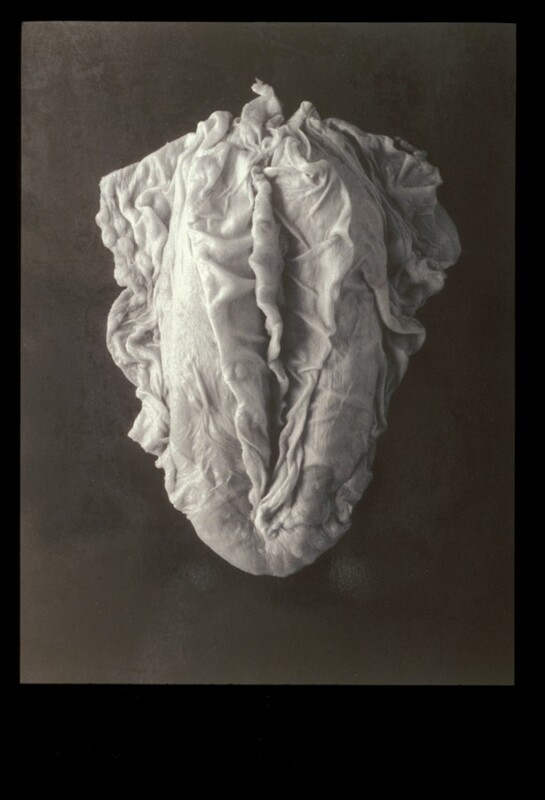 The Becoming Series consists of scores of small-scaled photographs of elaborate configurations of meat and skin fashioned into hermaphroditic or undifferentiated genitalia. Inspired by stories of Herculine Barbin and Saartji Baartman, I sought to re-create fantastical bodies that evaded easy classification. I harnessed the allotropic nature of photography to mirror this embodiment; the figure pictured is at once promised to be a real body and yet it is fanciful and fabricated. The performative nature of this series serves as an elegy for those who suffered in the craze to pathologize and force real lives into rigid taxonomies. It also contemplates the larger condition of corporeality as beautiful and grotesque, resplendent but incomplete.